Loctite 270 is a high-strength threadlocker for maximum efficacy in the securing and sealing of bolts, nuts and studs to prevent loosening due to vibration. The product serves to permanently lock assemblies which must not come loose. It works on all metals, including passive substrates such as stainless steel, aluminium and plated surfaces. It is proven to be tolerant of minor contamination due to industrial oils, e.g. engine oils, corrosion prevention oils and cutting fluids. Can be disassembled by heating to 300. Loctite 270 is designed for the permanent locking and sealing of threaded fasteners. The product cures when confined in the absence of air between close fitting metal surfaces and prevents loosening and leakage from shock and vibration. Loctite 270 is particularly suited for heavy duty applications such as studs into motor housings, nuts onto studs in pump housings and other fasteners where high strength is required. 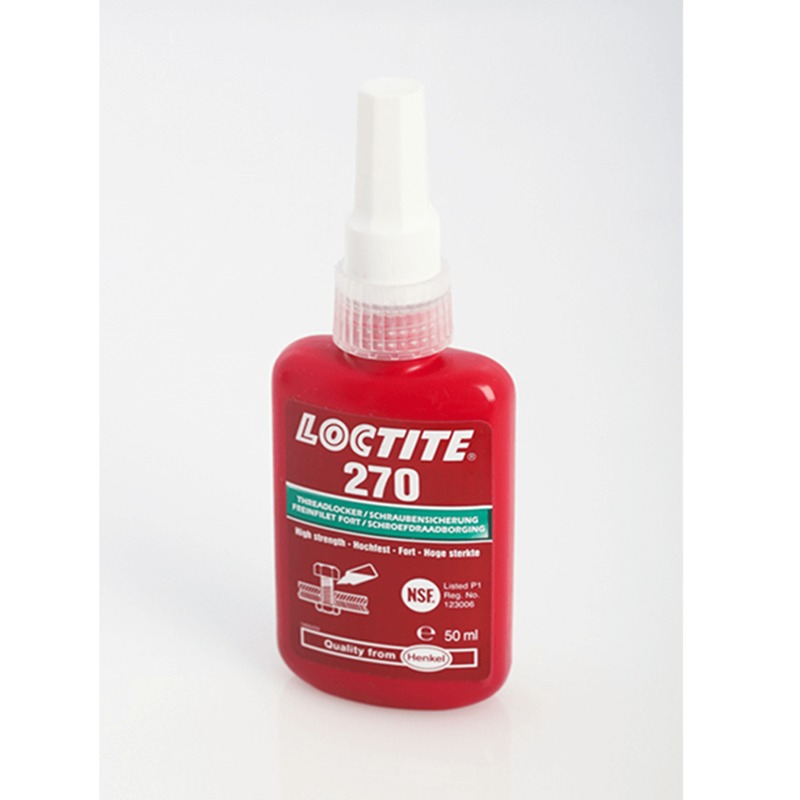 Loctite 270 provides robust curing performance. It not only works on active metals (e.g. brass, copper) but also on passive substrates such as stainless steel and plated surfaces. The product offers high temperature performance and oil tolerance. It tolerates minor surface contaminations from various oils, such as cutting, lubrication, anti-corrosion and protection fluids. The rate of cure will depend on the substrate used. The graph shown in the data sheet shows the breakaway strength developed with time on M10 steel nuts and bolts. compared to different materials and tested according to ISO 10964. The rate of cure will depend on the bondline gap. Gaps in threaded fasteners depends on thread type, quality and size. The graph shown in the data sheet shows shear strength developed with time on steel pins and collars at different controlled gaps and tested according to ISO 10123. The rate of cure will depend on the temperature. The graph shown in the data sheet shows the breakaway strength developed with time at different temperatures on M10 steel nuts and bolts and tested according to ISO 10964. Where cure speed is unacceptably long, or large gaps are present, applying activator to the surface will improve cure speed. The graph shown in the data sheet shows the breakaway strength developed with time on M10 zinc dichromate steel nuts and bolts using Activator 7471, 7649, 7088 and 7091 and tested according to ISO 10964.